These are just a few comments from attendees who have participated in the hands-on chemistry lab experiences offered through the Department of Chemistry and Physics at Belmont’s annual It’s Easy Being Green: Budget-Friendly Safety-Conscious Chemistry Labs for the Science Classroom of Today summer workshop series for middle and high school physical science and chemistry teachers. The workshop this year, Please Pass the Salt: Chemistry – It’s “Saltsational,” engaged participants in lab work focusing on mixtures, limiting reactants and colligative properties. 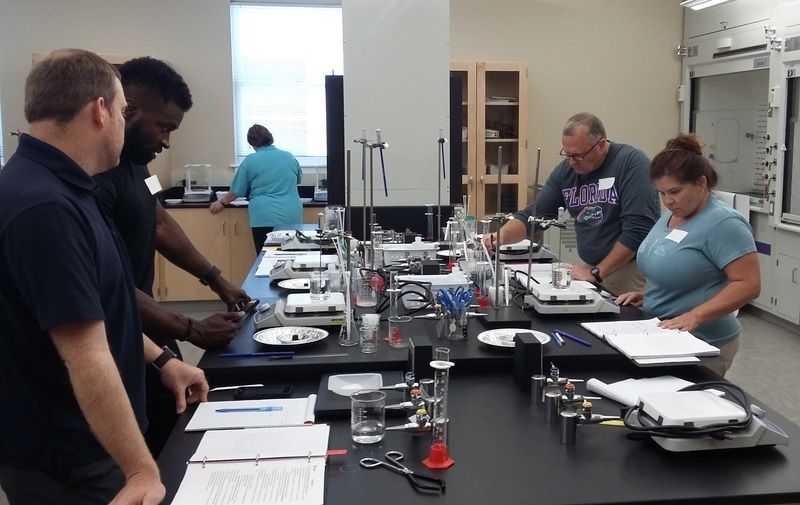 All attendees received a complete instructor-student lab manual and built a budget-friendly separatory funnel to take back for classroom use. While data analysis always plays a large role in the activities, Garrett placed extra emphasis on in-depth discussions of error analysis this year.